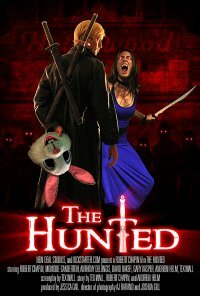 The Hunted is basically just enormous fun: While the movie's designed to be an action-horror hybrid and features some expertly executed and really cool action setpieces, it also doesn't take itself seriously one single minute. But that's not to say the movie's a moronic laugh fest, it does feature plenty of tension, suspense and gruesomeness, just always with tongue firmly in cheek - which totally works for the movie, as its plot is not exactly original, so the art of making this one interesting lies within how to tell its story - and in the case of The Hunted, this is exhilarating most of the time! And add to that a directorial effort that gives the whole thing a certain 1980s B-action look, well-staged fights and some inventive kills, and you've got yourself a pretty fun movie indeed!